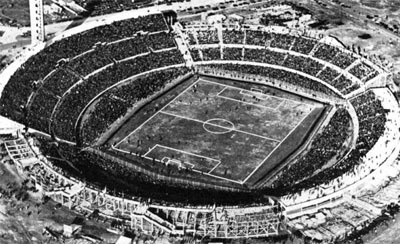 In 1929, it was decided that the first ever World Cup would take place in Uruguay from 13 July to 30 July 1930. Thirteen nations would be participating after accepting invitations – no qualifications took place. In 18 matches, 70 goals would be scored including the first hat-trick in World Cup history by Guillermo Stábile. When the tournament was over, Uruguay had been crowned as first World Cup champions. At the time for the event an economic depression took place in Europe. The travel expenses hindered some teams and also plenty of the European players were reluctant to leave their countries on a long trip, afraid that they would lose their jobs – this was long before it became normal with football players that could play for a living. In addition, there was much controversy and aversion involved. Also, the idea that professionals would be allowed (only amateur players were traditionally allowed in the Olympics) was the reason for Denmark and Germany to refuse to take part. Of prestigious reasons England would also refrain from participation. For a while it looked like none of the Europeans countries would make the trip to Uruguay and the first World Cup was in danger. In the end three European nations would send their teams to Uruguay of which none unfortunately were among the highest ranked teams was included. Many of the best European teams would be absent, such as Austria, England, Hungary, Italy and Spain. The European teams that finally traveled over the Atlantic would be helped economically by Uruguay that at the time was a country with great economy. The host team Uruguay was the favorite to win. They had won the Paris Olympics 1924 and in Amsterdam Olympics 1928. But on the other side had the closest rival Argentina won the South American Championship in 1929. 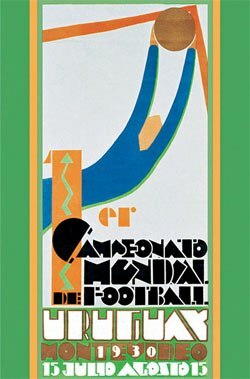 The national team of Brazil had not yet become the powerhouse that it later would be and would arrive to the first World Cup ill prepared (due to internal disputes, they were only represented by players from Carioca). Besides from not being the best team from the continent, the Europeans teams would also suffer from the travel conditions: ten days on a boat without chance for training. The reason a group phase was taken into practice (which was not done in the Olympics) was actually to give the long distanced guests the pleasure to at least play two games. The tournament was played with a group phase followed by Semi-finals and a final (a match for third place wasn't played). All the matches would be played in the capital Montevideo at three different stadiums. The final would be played at Estadio Centenario with a capacity of 90,000. An old rivalry between Uruguay and Argentina was expressed without questions by the majority of the audience booing the guests in their first match against France to that extent that the Argentines treated to leave the tournament. The president of Uruguay had to mediate. Yet, it was in the last match in the group between Argentina and Chile that things really got out of hand. The most players of both teams got involved in a large scrimmage after an incident between two players. After a break the match continued and Argentina won the match and also the group. Yugoslavia and USA would surprise many by winning their groups and advance to the Semi-finals. USA that had been humiliated by the Argentinians in the 1928 Olympics with 11-2 would once again be crushed by them in the Semi-finals, this time by 6-1. On behalf of the Americans pride, it should be added that two of their players were injured and – as the bizarre rule at this time dictated – were not allowed to be replaced. Uruguay would defeat Romania and Peru in their group and then beat Yugoslavia by a large margin in the Semi-finals. The result would not reflect the game to a full extent, however. 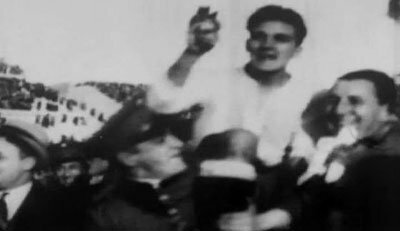 Yugoslavia that had taken the lead had one goal disallowed by a strange decision from the referee and two of Uruguay's first goals were approved in unconvincing circumstances. In the final they faced the archenemy Argentina who also had been their opponents in the final in the 1928 Olympics tournament. 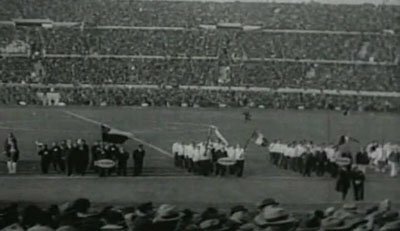 In the presence of over 80,000 people at Estadio Centenario in Montevideo (the attendance figures are debated: the official attendance was 68,346, but it was undoubtedly more people watching the game and some sources claim it was over 90,000 people), Uruguay could pull off another victory with four goals against two after Argentina had had a 2-1 lead. The football players of the Uruguay team would renew their status as the pride of the nation. Uruguay would defeat Argentina in the final with 4-2. The friendship between the two countries would be affected negatively for a time after the final. Players of the Argentine side had felt threatened before the game by supporters and one player had received death threats. Argentinian supporters would also report of being harassed during the event. As a revenge, the Uruguayan embassy in Buenos Aires was vandalized by citizens and the government cut off the relation to its neighbor country.